History: Scrapped on 30 June 1947. 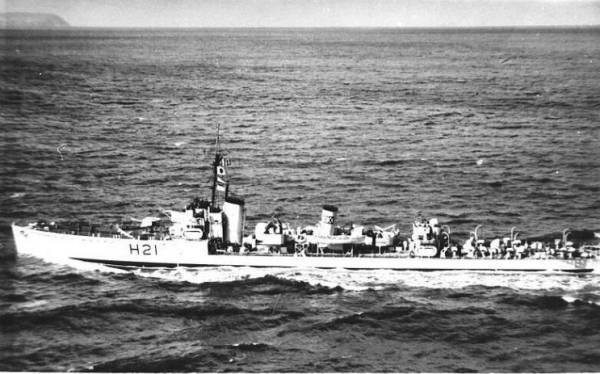 HMS Scimitar (Lt. R.D. Franks, OBE, RN) and HMS Vanquisher (Cdr. C.B. Alers-Hankey, RN) together pick up 43 survivors from the British merchant Humber Arm that was torpedoed and sunk by the German submarine U-99 60 nautical miles south of Fastnet in position 50º36'N, 09º24'W. The German submarine U-651 was sunk south of Iceland, in position 59º52'N, 18º36'W, by depth charges from the British destroyers HMS Malcolm )(Cdr. C.D. Howard-Johnston, DSC, RN), HMS Scimitar (Lt. R.D. Franks, RN), the corvettes HMS Arabis (Lt.Cdr. J.P. Stewart, RNR) and HMS Violet (Lt.Cdr. K.M. Nicholson, RNR) and the minesweeper HMS Speedwell (Lt.Cdr. J.J. Youngs, OBE, RNR).